Drone technology has made commercial roofing inspections safer and easier for contractors. But contractors are not the only ones to benefit from this technology; drones have also made roof inspection more thorough, faster, easier and more cost-effective for commercial building owners and homeowners. Drones can easily access areas that are difficult or hazardous for a contractor to reach. As an added benefit, inspections can be finished faster due to the minimized risk, allowing home and building owners to receive the results in a shorter amount of time. Since drones are able to easily access these areas, they’re also able to gather more accurate and more in-depth data than a contractor. In fact, a roof inspection conducted by a drone can be finished a three times faster than one done through conventional means. Take for example the case of traditional infrared roof scanning, which is used to find pockets of trapped moisture. In a conventional infrared roof inspection, either a technician with an infrared camera or a manned plane with an external infrared camera would take images of your roof. The technician might not be able to reach certain areas off the roof, while the plane might not be able to produce detailed imaging from afar. Drones solve both problems: thanks to their smaller size, drones can hover closer and take pictures of hard-to-reach areas. Plus, a drone utilizing the latest technology can take measurements more accurately and capture greater resolution. Homeowners and building owners can also utilize aerial imaging to check the condition of their gutters and drainage systems. In particular, building owners need to conduct aerial imaging more frequently to ensure problems with drainage don’t result in ponding water that can seep into the roof. However, the costs of conducting aerial imagery are often prohibitive due to the equipment needed to conduct this work. Another disadvantage is that building owners need to work around the aerial imaging company’s schedule. But with drones, building owners can schedule more frequent and cost-effective aerial roof assessments. Contractors simply need to attach infrared cameras to the drones, which they can operate from a remote location, eliminating the need for manned planes. 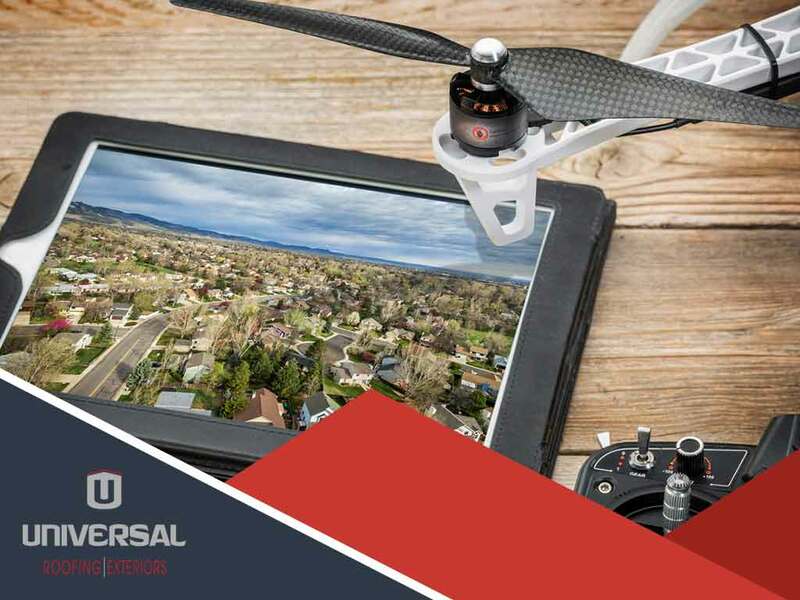 Universal Roofing and Exteriors, your local siding contractor, offers drone roof inspections. As a GAF Master Elite® roofer, we can guarantee quality service. To set up an appointment, you can call (317) 257-0779 or fill out this form. We serve clients in Carmel and Indianapolis, IN.